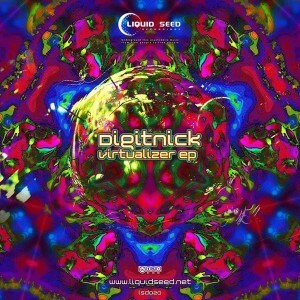 Liquidseed presents its first underground psytrance release of 2015, welcoming Digitnick to the fold with Virtualizer. Hailing from Greece, this artist provides an unexpected trip into pure psytrance full of colour and energy to touch mind, body, and soul. Alongside a remix of Naturelement this release features three original compositions with old school mystical vibes throughout. We hope to make you dance in trance! Mastered by Emmanuel Lagudakis AKA Acid Lagos @ Liquidseed Studio, Greece, with design by Angelo Zs. MP3 Download | FLAC Download | WAV Download · Download count: 8,006.
pretty good release, but i do think it lacks a bit of a sound quality…. Yeah, it is moving. You made me dance. Very nice, Bravo! really tripping, intense and beautiful! A space jouney! One of the best goa works I have heard in ages! goa and progressive style too ?